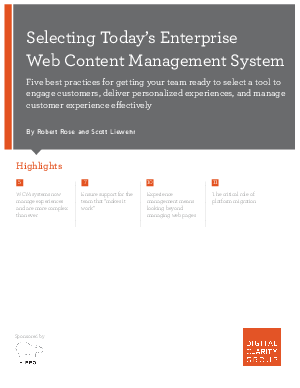 Web content management (WCM) has changed. Both marketers and consumers are taking more and more control over web content. And, as they do, it’s no secret that the amount of content in the organization, along with the tools producing it, have increased significantly. The production of social and mobile content alone has more than doubled the number of properties that the average business is now responsible for managing. The business need has changed from simply managing web content to managing user experiences and supporting a buyer’s journey across multiple channels. As a result, selecting a new WCM solution is more complex than it has ever been before - this Insight Paper will provide you with best prqactices to make the right selection.